Secretary of State Bill Gardner showcases the oldest desk in the State House, which is located in the Senate chamber, as UNH Law School Professor Emeritus Richard Hesse looks on. 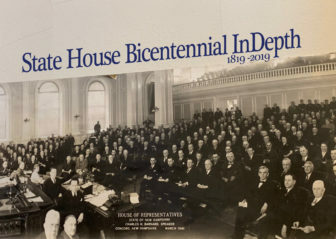 Editor’s note: This video by Evan Lips is the second in a series the New Hampshire Center for Public Interest Journalism has produced in celebration of the 2019 State House Bicentennial. 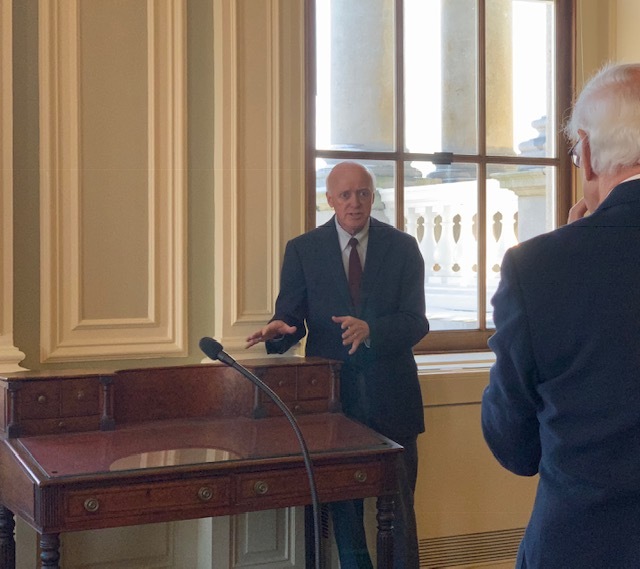 CONCORD – Celebrating the Bicentennial of New Hampshire’s State House, Secretary of State Bill Gardner talks about the history of the oldest desk in the state capitol – an antique that dates back to at least 1819, the year the building opened. InDepthNH.org is celebrating the Bicentennial of New Hampshire’s State House. His office still holds a copy of the original bill of sale – but the desk made a disappearing act between then and now. An assist from Delaware’s famous DuPont family brought the desk back home. 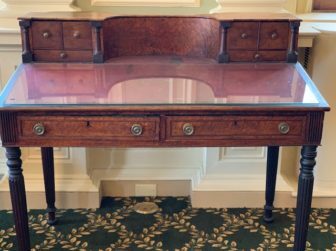 See story and videos below about another desk – the House reporters’ desk – that also disappeared for a time before finding its way home to the State House.